If you're like me, you're always wondering what kind of car you're going to buy next. Even though I'm very happy with my current whip and I plan on keeping it until it dies, I'm kind of always wondering what else is out there. Call it natural car curiosity. 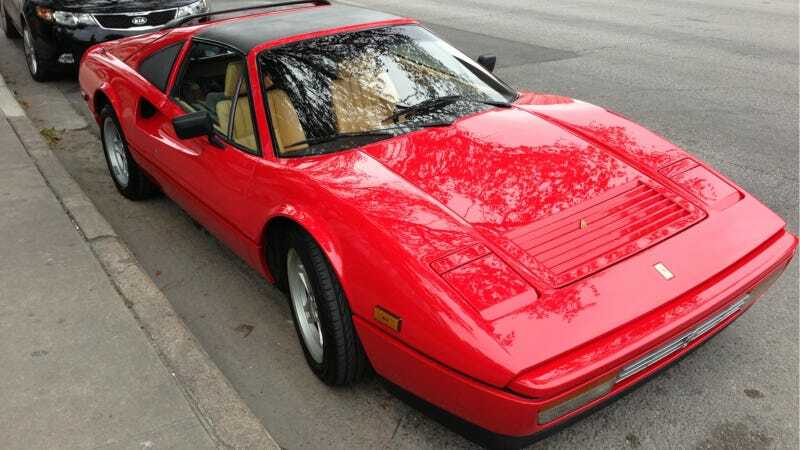 But ever since I found this very red and very pretty Ferrari 328 GTS near downtown Austin, I stopped wondering. I want a used Ferrari next. Go big or go home, right? Forget reliability, insanely expensive maintenance and parts, lots and lots of fires, or the fact that you may come off looking like a douche. Nobody ever bought a Ferrari purely for left-brain reasons. And after seeing it, my girlfriend also declared that we need one, so I've got that going for me too. So what better place to start than this 328? Sold between 1985 and 1989, the 328 was the replacement for the 308 of Magnum, P.I. fame. The 328 GTS packed a mid-engine V8 good for 270 horsepower at 7,000 RPM and could do the zero to 60 mph dash in about 5.5 seconds. Quick by modern standards, extremely fast by 80s standards. This Forbes article gives some great insight into why it's an excellent used car buy. They report that it's one of the most reliable Ferraris ever built (though it's surely no Honda Civic), and the technology it has won't overwhelm the average mechanic. This may explain why we found this 328 GTS in such great shape. It's a Ferrari with pop-up headlights! And it's red, too! What more could you want? Unfortunately, there is one barrier to my dream of old-school Ferrari ownership: cost. A search on cars.com reveals that the 328 GTS has held its value very well, with some models topping $60,000. So while it's still cheaper than a new Ferrari, it's out of my range for now. Someone buy me one! What used Ferrari would you put in your garage?